Online savings accounts are accessed entirely online (though some also have ATM cards). Since this saves the bank money, they often pay higher interest rates. You keep a local checking account, and transfer to/from the online account electronically. This page has information on accounts in the United States. I also have information on accounts in other countries. 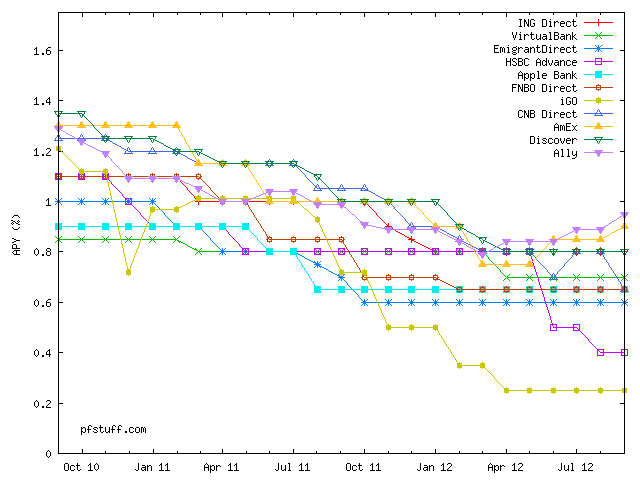 The information in the table below was last verified October 1, 2012. Interest is credited monthly for all accounts. Ally Online Savings 0.95% — A relaunch of the former GMAC bank (in May 2009), now with no fees or minimums. American Express High-Yield Savings 0.90% — Another foray into banking from a large credit-card company (this one since June 2009). ING Direct Orange Savings 0.80% $25 if you let me refer you and you deposit $250 (I get $10) The oldest of these online-savings accounts (since 2000); there's a book out on their history, if you'd like details. Email me (see bottom of the page) for referrals. Probably the best interface and customer service of any of the accounts I've used. Discover Bank Online Savings 0.80% — Note: Has a minimum $500 initial deposit (but no minimums after account opening). This is newish (since July 2009) foray into banking from credit-card company Discover. Reports so far are that the interface and customer service are a bit clunky, but improving after it recently (March 2010) acquired E*Trade's online savings business. VirtualBank eMoneyMarket 0.70%* $20 if you let me refer you (I also get $20) Higher yields for high balances: 0.70% for $10,000-$24,999, 0.73% for $25,000-$49,999, 0.78% for $50,000-$99,999, and 0.83% for $100,000+. $100 minimum initial deposit. $5/mo inactivity fee if no activity for 12 months. Email me (see bottom of the page) if you'd like a referral. CNB Bank Direct High Yield Savings 0.65% — Online account of Citizens National Bank, a small but established bank in Ohio. Apple Bank Grand Yield Direct 0.65% — Note: Has a minimum $2,500 initial deposit (but no minimums after account opening). HSBC Online Savings 0.40% — Comes with an HSBC ATM card. Their account-opening process is lengthier than most, involving several pieces of snail-mail, and takes 2–4 weeks total. 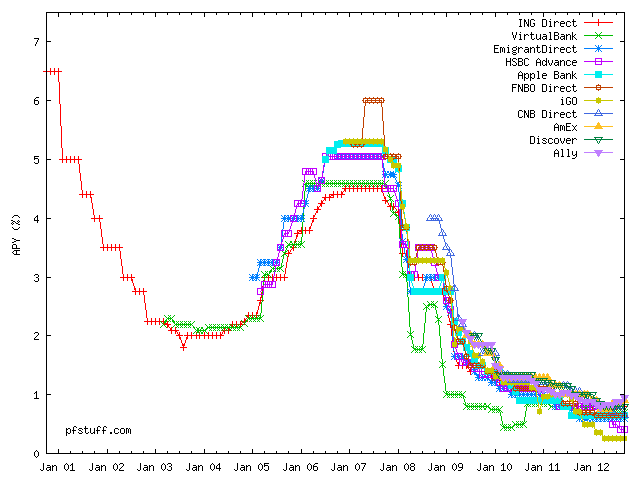 Charts of the rate history for each account since its inception. Data points are as of approximately the middle of each month, but may be slightly inaccurate (especially the very old ones). Disclaimer: This is a personal website with some information I've collected. I'm not a finance or investment professional. You should verify any information here before doing anything important with it.